Bless my stars! The Constellation Mug is adorned with shining stars piercing through the blanket of the night sky. 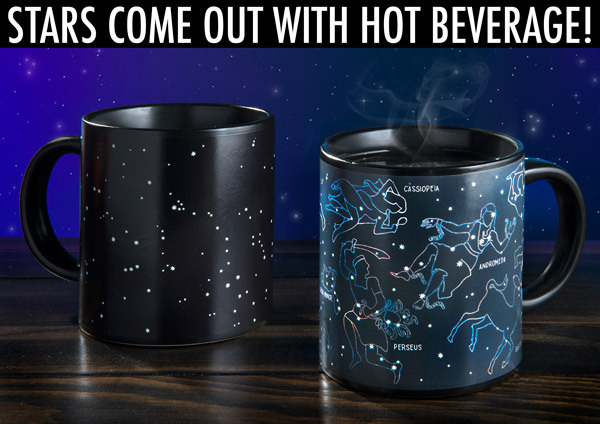 When you add a hot beverage to the mug, illustrations depicting eleven different constellations appear. With a little coffee or tea, you can admire the same constellations that shone over the ancient Roman empire: Castor & Pollux, Scorpius, Orion, Taurus, Ursa Major, Ursa Minor, Cassiopeia, Perseus, Andromeda, Sagittarius, and Hercules. When the sun goes down at night and the world cools off, it's the stars' turn to shine. 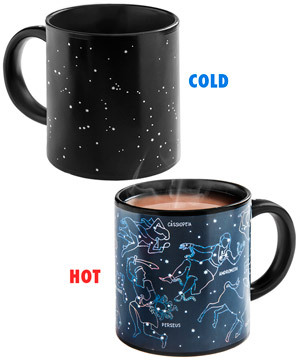 If you can't wait 'til then, heat up the Constellation Heat Change Mug with a warm beverage and watch the stars shine. Pour in a spot of morning tea and marvel as the son of Zeus reveals himself, or have a cup of joe with the beautiful Andromeda. Whichever hot beverage you choose to enjoy, the Constellation Heat Change mug will keep you looking to the stars. There is no fault in these stars. When a hot drink is poured into the Constellation Heat Change Mug, the outlines of the characters and symbols imagined by our ancient ancestors reveal themselves. The change occurs in seconds, letting you admire the universe's vast wonders almost immediately. When you have finished the last drop, the mug will return back to the deep starry space it started as. Aristotle wished he had this mug. 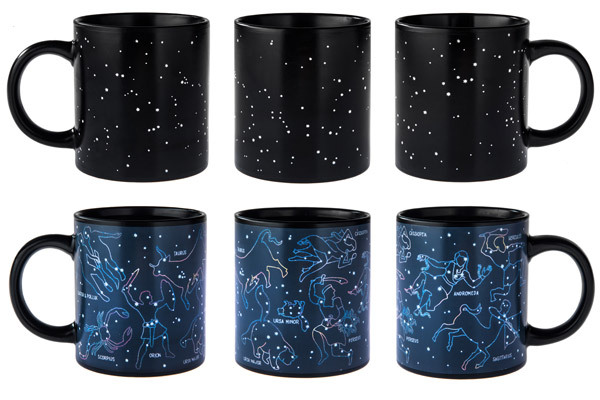 Can you find all eleven constellations before they reveal themselves on the mug? Probably not at first, but for a stargazer, this mug goes beyond just finding Orion’s belt in the night sky. Search for Castor and Pollux, the twin brothers, or find an astrological sign like Taurus. The Constellation Heat Change Mug is an ideal gift for astronomers or young minds looking to learn more about the universe around them. Looks like Orion really has his work cut out for him. Question: How long before it changes back to just the stars? 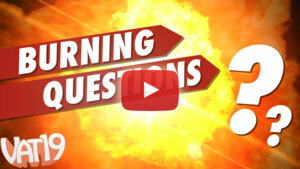 Answer: It all depends on how hot the mug got and how fast you drink your beverage. Typically, however, it takes between 8 and 12 minutes. Question: Is this an accurate star chart? Answer: While there isn’t nearly enough space to cover every star (there are billions in the sky), the constellations depicted on the mug are accurate.